Site 26 looking south to the Ox Mountains, where the neolithic cairns of Doomore and Croughan are visible. Circle 27 is to the right of the photograph. 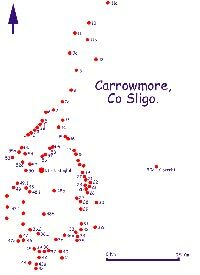 Circle 26 is located outside the main group around the visitor centre at Carrowmore. It is just beside the road, in the same field as Site 27, as you approach Carrowmore from the south. The boulder circle is 17 meters in diameter, and the stones were placed on a stone packing to keep the boulders level. The circle is complete, with all it's 34 stones present, but 4 of the stones have been displaced. One large stone, on the southeast side was removed and pushed back to make an entrance in the Bronze age. Several loose boulders around the circle may be the remains of a small dolmen which was dismantled during the remodelling. 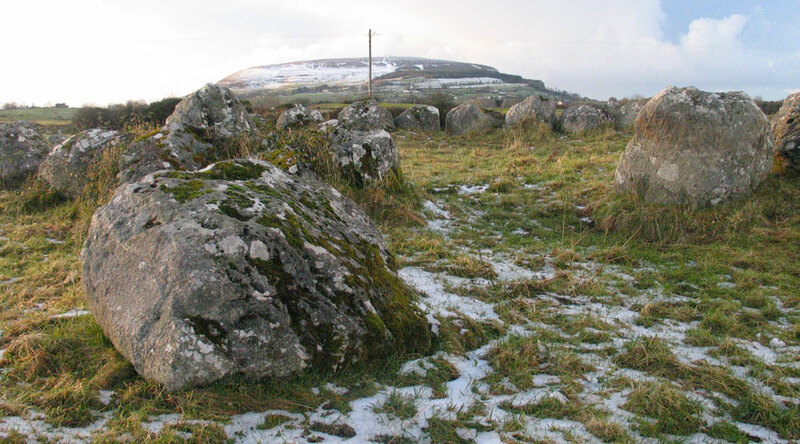 One of the loose stones is a split boulder, which was often the type of stone used for a capstone at Carrowmore. This is one of several sites that was excavated by Burenhult's team in 1978 and 1979. They found that the site had been reused in the Bronze and Iron ages. 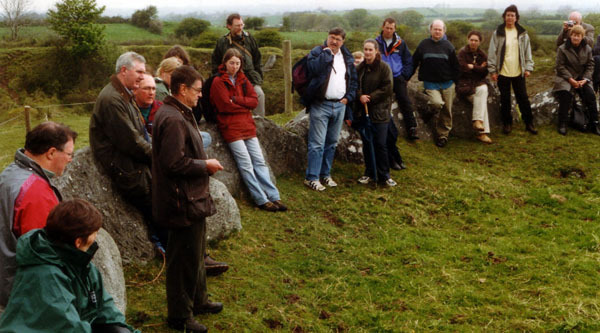 Site 26: Dr. Burenhult leads a tour and discusses the excavation of this monument during the Stones and Bones conference in 2001. Four postholes were found within the circle by the gap at the southeast. There was probably some kind of a wooden entrance structure built here. Furrows were found within the western side of the circle, and 10 pits which contained charcoal and burnt stone. A ditch was dug around the inside of the circle, but did not cross the gap in the southeast. These activities took place around 500BC. Dr. Burenhult's photomontage of Site 26. An inhumation was placed in a pit at the centre of the circle around 90 BC. Finds from this circle include 1.5 kg cremated bone and an antler pin. Other materials found were more cremated bone, unburnt bones belonging to humans, cattle, hare and duck; a grinding stone, a potsherd, some blue glass beads and some burnt grains, which were mainly barley. Situated to the S. of 25, and near the road, (dolmen-circle). "This circle is nearly perfect, but wants the cromleac or kistvaen. The stones are large, and, as usual, placed quite close to each other. They are thirty eight in number, and the diameter of the circle is 50 feet" - Petrie. Circle 26, looking through the gap that was made in the Iron age. The large boulder in the foreground was pulled out and some kind of timber structure was erected in the gap.